Get this book for Kindle. For 32 years Ned Crabb was an editor, writer and illustrator for The Wall Street Journal; he still free-lances for the Journal. This is his second novel. He and his wife Kay live in New York City and spend most of each summer at their camp on North Pond, in the Belgrade Lakes chain. They have two daughters. 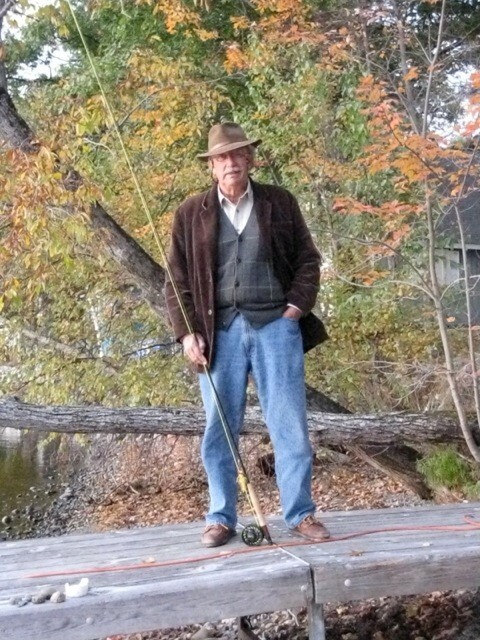 Huge, historic Cedar Lodge, nestled on the shore of lush, sylvan Willow Pond, is one of Maine's most famous fishing camps, renowned for its gourmet kitchen and home of celebrated guides Brad Seldon and Merrill Beauchamp. Fishermen from all over the world come to this sportsman’s paradise. But lurking beneath this empyrean exterior is a viper’s nest of greed, lust, revenge, and homicidal fury. When Iphigene “Gene” Seldon, rugged, cruel owner of Cedar Lodge Enterprises, who keeps her nephews and niece trapped under her domineering thumb, is horrifically murdered during a raging thunderstorm, a whirlwind of violence is released. More murders terrify the lodge’s guests and baffle the local sheriff and deputies. Caught in the midst of this savagery are two diffident retired professors, Six and Alicia Godwin, who stumble onto the answers to some of the frightening mysteries and eventually save the day during a rampaging climax. "A most compelling read! Ned Crabb puts words together with vivid and inspired dexterity, cunningly establishing a fascinating set-up for murder involving a large cast of colorful—and notably libidinous— characters. Lightning Strikes' lakeside Maine setting centers on an upscale fishing resort run by a tough and much-hated dragon lady. And, as a major storm approaches, the scene is set for the sort of cataclysmic Götterdämmerung more often found on the operatic stage." "Crabb brings his unique command of regional locals to the tale of a Maine fishing resort; the result is horrifying, hilarious and brilliant." "Against the idyllic backdrop of a Maine fishing lodge, Ned Crabb creates characters filled with deceit and greed (and no small measure of lust) to spin a delicious tale of mystery and adventure that will hold you all the way to the startling micro-burst of a finish."